The Pleasant Home Ruler Pal will be the perfect addition to your sewing room. 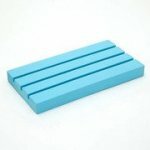 Perfect for organizing your acrylic rulers for a clutter-free workspace. Measures approximately 4.25" x 7.5". Holds three quilting rulers.